Zip Help Needed - Cavitation, Turbulence, Transom Height? Splashed! It's still a work in progress but I'm running out of summer and had to get it in the water. Unfortunately, I am having problems with the prop losing traction. I need some help. Glen-L Zip, 14'4" (stock). 1956 Mercury Mark 55E, regular one (16 1/2" transom). Transom built to 16 1/2" (measured vertically) per the 1961 Merc 400 plans I found on the web. With the pin in the 2nd hole, the motor AV plate is level-with and parallel-to the keel. In the first hole, the front of motor AV plate is about 1/4" below the keel and at the back of the motor it's lower than that. First test run was with 3 blade prop. Gas tank is under the bridge deck, with a 17 lb lawn mower battery in the back. I started in the second hole. Holding my breath and wearing my life jacket ... the boat planed quickly and predictably, tracked straight, but as soon as I hit some waves/chop, I lost traction. It felt just like spinning the tires. So I quickly backed off the throttle. Same thing happened in turns. So then I dropped the motor to the first hole (and thankfully not to the bottom of the lake ). It seemed to help some, but the problem was still there. Skeg: The skeg starts between stations 4-5, slowly tapers to 1 7/8" tall at 3' from the transom, then tapers down to nothing and ends 2' from the transom. I followed the Glen-L recommendations to taper the rear end of it (webletter #41); on the squirt they said 18" from transom, I upped that to 24" for the Zip. The Mercury manual says nothing on the bottom for 48", but I was worried that there wouldn't be much left in the water when this boat is on plane! 1. I have a 2 blade prop, I'm was going to try that first because it's easy, but I'm not very optimistic. Rationalizing that this is more of a coarse screw (like a drywall screw) than the 3 blade that would be more tolerant of turbulence. 2. Make the skeg shorter, and/or end farther from the transom. Could this be causing turbulence/cavitation? 3. Make the transom lower. I can only go about 5/8" lower without serious surgery because the clamp handles will hit the bottom of the motorwell. 4. Move weight farther to the back of the boat... anchor, tools, battery, gear? The boat didn't seem to be hose heavy or plowing at all, the balance seemed ok. The boat is 1/4" okoume with 1/8" solid African mahogany on the hull sides. The deck is 1/4" okoume with 3/16" solid African/maple veneers. 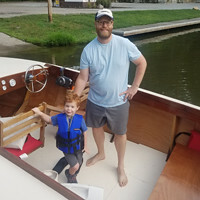 The transom is two 3/4" okoume plywood panels, with 1/4" African mahogany (two 1/8" layers perpendicular to each other) on the outside and 1/8" on the inside. All the frames/battens (T-batten reinforcements) is African mahogany. Keel is African Mahogany with 1/4" laminated okoume plywood on top. Last edited by HotSaws on Tue Sep 26, 2017 6:12 pm, edited 1 time in total. Nothing stands out as obvious to me. Seems like you have done everything right. What pitch prop is your 3 blade you have been using? Are you sure that the prop hub is not slipping? Or any weeds are interfering? It only happens in chop or turns and never when getting on a plane or in smooth water? From your description, your Zip is virtually identical to ours, right down to the Mk 55E. As Chris mentioned, it's possible that your prop is slipping on the hub. Out of curiosity, what prop are you running? We found that a 10" pitch, two-blade prop would give us ~30 MPH @ 5500 RPM, and with none of the problems you described. Our skeg terminated 24" from the transom and we had no problems. Thanks guys, you are the best. I've read both of your builds several times and studied your pics over and over! Both of your boats are spectacular, and I respectfully copied parts of both of them. I just got back from the lake, and the two blade prop performed much better, night and day difference. Both props came with the craigslist basket. The 3 blade is stamped 41923 and AMC581S, Michigan, I believe it's 10" diameter x 10" pitch. The 2 blade is stamped Quicksilver 23586A-2-11, I believe that it's 10" diameter x 11" pitch. Perhaps the 3 blade is spun. Here's a pic of the skeg. I'm not done yet, still have some lose ends to clean up. Looking forward to being able to sleep tonight knowing that the boat is at least close to correct. 1.) Spectacular boat! You "stealth built" that? Awesome! 2.) My bet is "spun prop". What you've described fits that to a "T"
Thanks Mark, appreciate the kind words. Yeah, I was picking away quietly on it last couple years, long time lurker. I felt that I didn't have too much to add that hadn't been already covered by the many other Zip build threads. And until my boat actually gets finished I do not feel qualified to be giving advice! I really love this forum, best on the net. My Dad, an AOMCI member, rebuilt completely the Merc. He did a great job. I built the boat. Just like everyone says, it's addictive. And really fun. The key for me was not being under a schedule, ... But in the Northeast I started having to race the weather, which made it less fun. Now that I know the hull is OK, I can tinker here, varnish there, at my leisure, which makes it fun again. Hardest part for me was the chines. Most everything else was straightforward, maybe tedious at times (eg sanding interior epoxy slops after flip), but all good. I agree with Chris. Sounds like the hub is slipping. Everything else looks ok.
Chris or Roberta: Didn't we have this one year at the Gathering. Somebody's boat ran good to a point. Then the engine rpm jumped and they had no more power. As I remember, there was a rubber "donut" with teeth on the prop shaft side and smooth on the prop side. If this donut is old or the prop nut is not tight enough it can slip. Wow, learn something new... I thought the older Mercury props were installed with shear pins, but based on a search, they had rubber hubs like the later exhaust hub props? I shoulda known the splines in the hub would have made that obvious. Cool. And great you solved that. Gonna be fun locating a three blade prop for your motor? Wow, that is a beautiful boat ! What a great steering set up. Are the clamp brackets and tilt tube modified, or from a later motor , or something ? We have an issue similar to your cavitation problem. with steering in the rear. The motor is a 1959 Mk 58A. At present it has a Quicksilver, bronze, two-blade, 12 pitch. I have tried different transom heights above the 16 & 1/2 inches. It likes the cavitation plate even with the boat bottom and parallel. But anything above that, we start getting cavitation upon initial acceleration, and in turns. speed on the straight away. Not sure if I have an opinion on that. But I have seen old Mercs run quite high. slight cavitation sometimes, and just will not go any higher on the transom. to reduce it in size, but it might help slightly. What a beautiful piece of eye candy, congratulations! Your skeg looks like it should be fine. Mine terminates very close to the transom but is only 3/4" wide and 3/4" tall with a very gradual taper that goes from full profile to nothing nothing over 12"-14" of length on either end. The 3 blade, 10" diameter, and 10" pitch is the perfect fit for my Mark35A, with 5 fewer HP than your 55, and I run 30 MPH at 5,600 RPM. The 2 blade, 11" pitch was just a bit too much prop for my engine but should be really close to correct for your greater HP, you might even be able to spin a 12" pitch. I tried a Mark58 with 45 HP on my ZiP and ran 33 MPH at 5,800 RPM with a 2 blade 12" pitch prop. If I throw my ZIP into a hard turn at WOT she will slide out on the turn a bit and rev up a bit with minor cavitation, but that doesn't concern me as I usually don't do that too often. Once you get your RPM at WOT you can dial in your prop selection, but odds are you are very close now. BillW wrote: What a great steering set up. Are the clamp brackets and tilt tube modified, or from a later motor , or something ? Thanks BillW, yes, we followed gdcarpenter's and Mark Shipley's lead and modified the tilt tube setup to accept a modern standard Teleflex steering cable. I've been thinking on this one. Many of the older engines just had a shear key on a tapered shaft. If the nut was really tight the prop might not slip until under much load even with the key sheared. I just don't know this engine. Awesome job on your boat! I bet you could teach a lot of us a thing or two! Hope you'll stick around the forum and help us out when you can. Ran the boat today some more with 2 blade 11" pitch. Consistent 28-29 MPH (GPS), 29.6 was highest speed recorded. This was with just me in the boat and all the safety gear and probably 15 lbs of tools. I still have to wire up the tach. The motor is basically new; I'd say it's only got about 4 hours on it total. Sometimes it feels like the stern of the boat gets a tiny bit "slippery" at WOT. Might just be my imagination too, overthinking it. It tracks straight, corners fine, no porpoising, and I can't detect any problems with the prop ventilating with any reasonable turns. Am I right in thinking that this suggests I didn't build too big of a skeg? I need to get on the lake before sunset (for once and not be in a hurry!) so I can do prop swaps and verify that 3 blade 10" pitch is spun. These are all nits really and I should probably just put my microscope away. The boat planes effortlessly and cruises great. We had it out with 2 full size adults (~450 lbs) in the front seat last weekend and the boat handled it very well. I love it. Thanks so much Glen-L! You numbers pretty much reflect ours. With the 10"-pitch prop I usually see 29 mph at 5,500 rpm. The 11" prop reduces the rpm to about 5000 with little to no change in maximum speed. It should be noted that our Mk 55 has never been apart, so your newly overhauled motor should have a performance edge. Your skeg is probably fine. I replaced ours with a fin a couple of years ago, and things really loosened up in the back end. It's not a big deal, just something we've had to get used to. Glad to see things are coming together!